The Motorola Talkabout MR350 is one of the best tools available o the market for campers and hikers. Given it’s range of up to 35 miles and with tons of additional features, this radio will fill a variety of needs. The radio is lightweight and can stand up to the rigors that you would expect to find in an outdoor or emergency situation, allowing operation even with gloves on during storms (because of the larger buttons). If you are on the market for a good two way radio, this is the best option on the market. 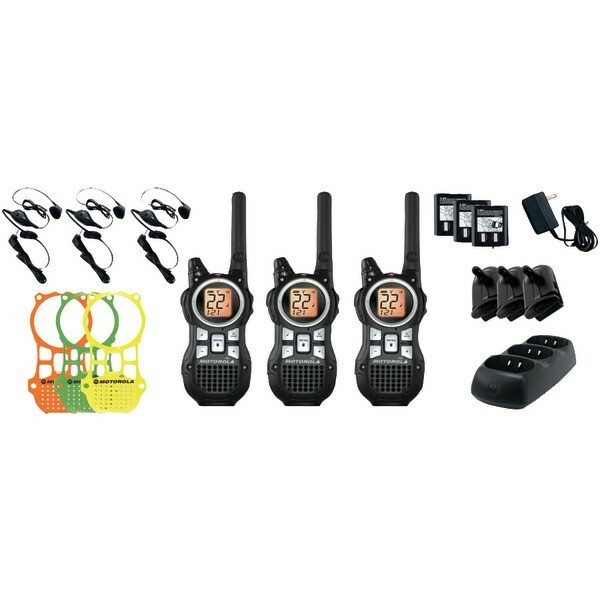 The Motorola Talkabout MR350 is one of the greatest tools that is available on the market for outdoor enthusiasts. With a high degree of functionality and a rugged design, it is the perfect communication tool for any situation. Better, it is lightweight, so it won’t hold you back in your activities, regardless of what they are. Designed with ease of use in mind, the MR350TPR gives you the ability to charge it in multiple ways. A triple desktop charging base is included which will let you charge all three radios included in the pack either at home via an AC adapter or through the mini-USB car cable if you are on the go. If you plan to go on a trip, the radios come with a mini-USB wall cable which can be used either with an AC adapter or with the help of your PC. It should be noted that the mini-USB car cable, wall cable, and PC cables are all sold separately. There are a number of convenient emergency alert features which are included with the MR350TPS. This includes an emergency alert button which, when activated, sends an alert siren our followed by any spoken words you have attached with the message. This function is extremely useful if you find yourself lost or unable to reach anyone. You can also utilize this feature to warn other individuals of danger or any pertinent information to the situation at hand as well. It doesn’t matter if you are going to be out there camping or if you are trying to make your way through an emergency situation, you will need to know if there is bad weather coming. The MR350TPR includes 7 NOAA weather channels which will help you with your packing and with your travel plans when you are outside. It is important to have access to emergency alert information and weather information in a number of situations, none of which is more important than trying to protect your family. One option, of course, is to distribute these radios amongst people in your neighborhood to help everyone plan better. These radios have up to a 35 mile range, depending on the exact conditions they are being used in. They also have 22 channels for communication. With the included VibraCall ringer, you can communicate between members of your party silently. Another interesting feature included with the MR350TPR is the Push-To-Talk Power Boost which, when being utilized, will let you extend your range of transmission by increasing the transmitter power output. When not being used, the battery life is saved by disabling this function, meaning you never have to worry about running out of battery power on the go. A few additional functions and additions to the MR350TPR extend its functionality. One of these are the additional 121 privacy codes which help to reduce the potential for interruptions during communication. Motorola has also seen fit to include a Quiet Talk function so that they can communicate with other, compatible, products that Motorola has put out. Hands free communication is available through the use of the iVOX function included with the radio. This is great for those times when you need to get a message out but you aren’t able to use your hands for the operation of the radio. Overall, the MR350 is a great choice for people looking for new camping gear or for an emergency preparedness tool. It is just as good as some of the higher end units on the market and comes at a lower price. That is hard to beat.